The first crash was reported on state Route 52 at Convoy Street in the Kearny Mesa area. Photo via OnScene.TV. 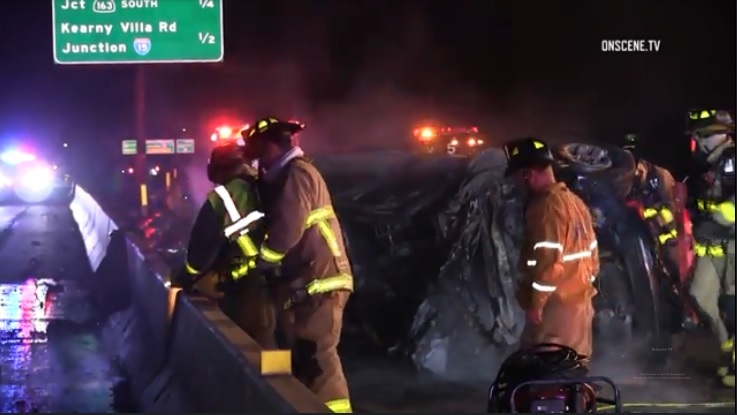 Three people were killed in crashes on San Diego-area freeways early Saturday morning. The first crash was reported at 12:36 a.m. on state Route 52 at Convoy Street in the Kearny Mesa area. One person died, but no details were immediately available. At 4:21 a.m., California Highway Patrol officers responded to a crash on northbound Interstate 5 near the Cockleburr Road overpass, a couple miles north of the Oceanside Harbor Drive exit. One person was killed in that crash, according to the CHP. Another person died in a three-vehicle accident on eastbound state Route 94 near Federal Boulevard in Oak Park a little before 3:30 a.m., the CHP said. The crash involved a Honda Civic, a Hyundai Sonata and a motorcycle. That crash was under investigation for much of the morning, and only one lane was left open as authorities investigated the accident, snarling traffic back to the Interstate 805 interchange. All lanes were re-opened by 10:20 a.m.